Husband and I recently riveted ourselves with The Girl Who Kicked the Hornet’s Nest. This third installment in the series based on the posthumously-published Millennium Trilogy by Swedish author Stieg Larsson is the best yet. Lisbeth Salander (tattooed computer hacker) is recovering in hospital and awaiting trial for three murders when she is released. Mikael Blomkvist, the journalist and publisher of Millennium magazine who has been her constant if distant ally wants to prove her innocence, but Lisbeth must be willing to share the details of her sordid experiences with the court. Sitting next to Husband, who has read all three of the books (numbers one The Girl with the Dragon Tattoo and Two The Girl Who Played with Fire) it was easy to appreciate the skill of the Swedish film-makers. Characters are clarified, plot-lines pared-down, scenes lengthened or left out. So that the finished effect was a filmic format that celebrated the cinema but was just as visceral, violent and compelling as the books. It’s by no means obvious or easy to track down the tricks for turning a written story that’s well-known and super successful into a visual medium. 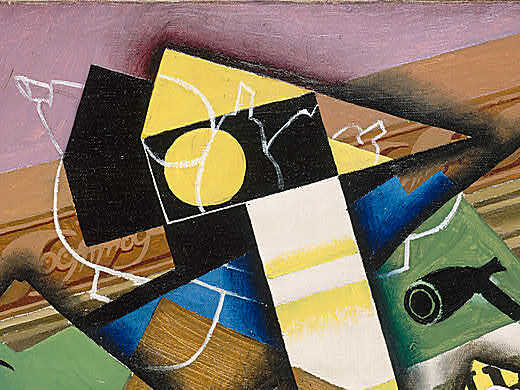 But that’s exactly what Juan Gris did when he took on Fantômas in his painting of the same name (dated 1915) at the NGA. 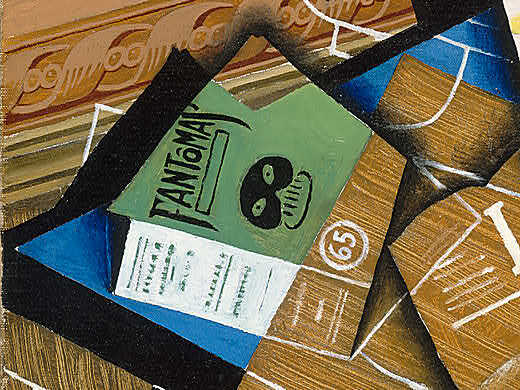 Fantômas was the sadistic protagonist of bestselling crime novels of the early 20th century and here the artist has absorbed the texts and transformed them into a beguiling and brilliant bit of art. 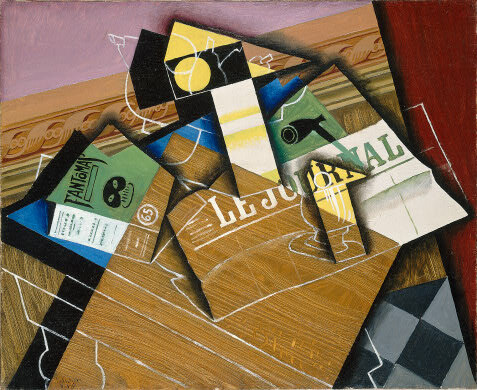 Fantômas was a man said to be nowhere and everywhere at the same time, and that slippery essence seems to inhabit this still-life. In fact still-life might be a bit of a misnomer in this case, since the objects appear to be anything but still. 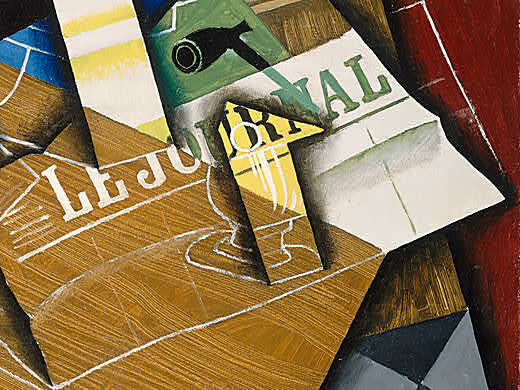 A table, a glass, a newspaper, some fruit, a pitcher, a pipe, a chessboard and more all melt and merge magically into each other. Gris is good at this sort of collapsed space between objects, putting out an oddly-angled perspective that’s traceable in the top Cubist artists. Each object offers only a ghostly trace of itself, a contour here, a texture or color there and he uses a system of overlapping planes to provide the picture’s spatial structure, differentiating each layer from the next by alterations in tone or texture. 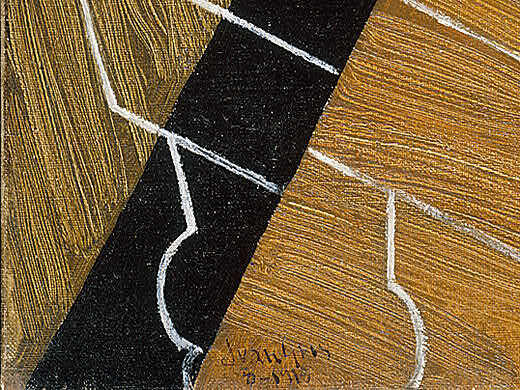 This was the perfect project for Spaniard Gris (1887 – 1927) who’s generally considered the “third man” of Cubism (after Georges Braque and Pablo Picasso), showcasing his particular painterly rigour, clarity and colourful approach. It end up as an excellent combination of his Cubist credentials and his skills for conveying the character and creepiness of the Fantômas franchise.